Mahesweta (lovingly called as Riki) is a 2nd year law student of Utkal University. 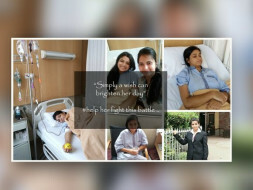 She is 18 years old and suffering from a rare disease BPDCN (Blastic Plasmacytoid Dendritic Cell Neoplasm). It is a type of acute lymphoma or blood cancer. In the past 4 years only 11 such cases were witnessed in India. And she is the first such case in her age group, that even doctor can't follow a specific guideline for her treatment. She is a simple girl living a normal life with her family with lots of dreams and passion for becoming a lawyer from her childhood, but now she can't even think of completing her graduation. Now her chemo therapy is going on. 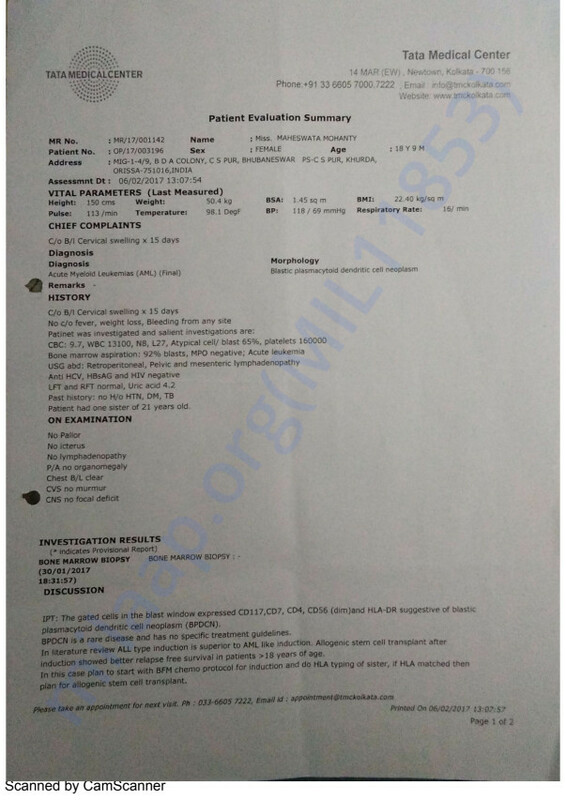 As per the doctors her bone marrow is producing an abnormal amount of WBC resulting in significant deficit of RBC and cancer cells has been activated, so there is a dangerous risk to her life. As a last resort she needs a bone marrow transplant after chemo therapy for 2 months. 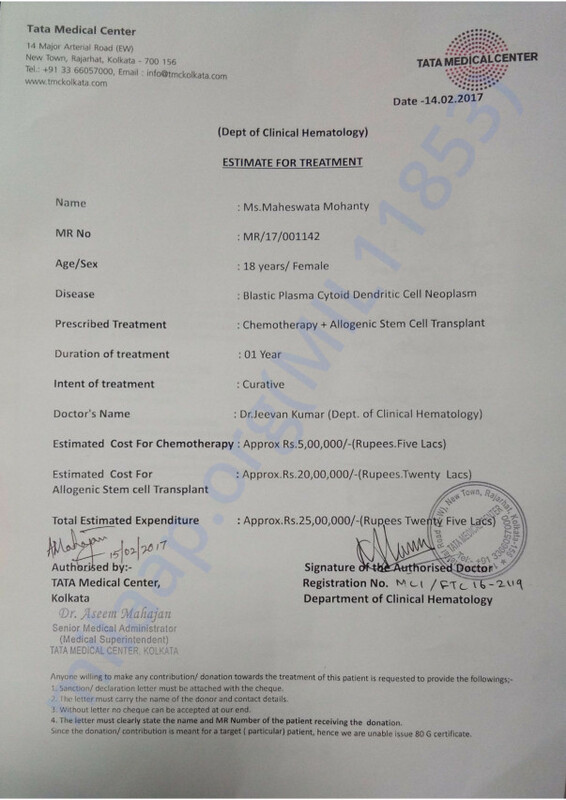 Her treatment is going on at TATA MEDICAL CENTER, Kolkata and the cost estimation is around INR 25,00,000/-. She is my younger sister and we belong to a normal middle class family and it would be very difficult for us to arrange such a big amount within a short period of time. We need your help and support to bring back a normal life to her. Your small support can bring hopes and confidence for her to fight against the Blood Cancer. My sister was an angel came for a limited period to spread happiness and love. She was very lucky for getting enormous support from all of you to fight till the last. She always wanted to contribute back the similar support and help to the society, that she got during her need. So, we are planning to donate the remaining amount collected for her treatment to 2 orphanages near our place. Also she likes clothes and shoes very much and had a huge collection of those. Now we are planning to give those to the orphanage, where girls like her can wear those and we can see Riki in them. Where ever she is she will be happy to see smiles in those faces. Riki was undergoing chemotherapy but last week when she was at home her BP dropped and she became extremely weak and was unable to hear or see. She passed away at home. All the funds will be used for her outstanding medical bills and expenses. Thank you for supporting her. May her soul rest in peace. I am extremely thankful to all of you for showing so much love for Mahesweta. She has completed her first cycle of chemotherapy. She suffered from fever for a few days due to a stomach infection and vomiting developed as a side effect, but she recovered soon. She still has constant hand and leg pain. We have now shifted her to SUM Hospital, Bhubaneshwar where she is currently being treated. Kindly continue to pray for her speedy recovery. I thank all of you once again.